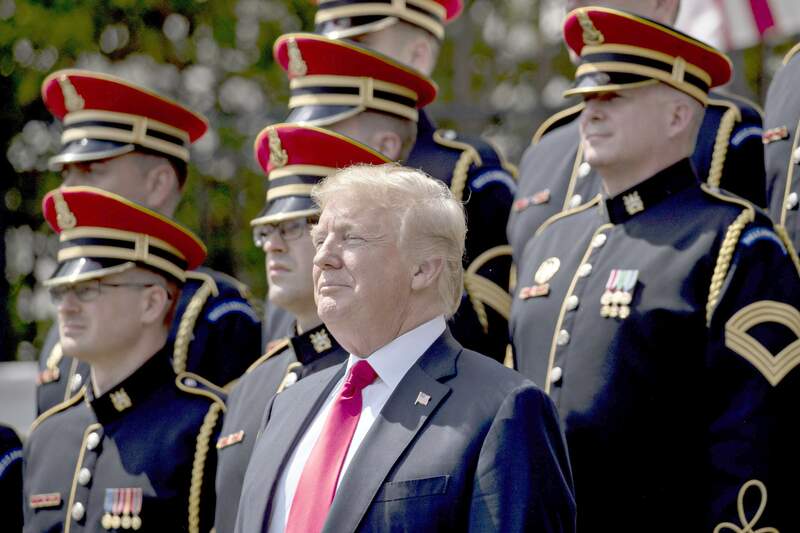 But then the Marine Corps band struck up the familiar strains of “God Bless America.” And when video of the ensuing moments went viral, many people speculated that perhaps the song isn’t actually so familiar to Trump. Champion of patriotism though he might be, his lips stopped moving during most of the lyrics. Those lyrics have a storied history – one deeply entwined with America’s ever-uneasy relationship between religion and politics. The song was written by an immigrant. Irving Berlin arrived in New York at age 5 as Israel Baline, the son of a cantor fleeing persecution of the Jews of Russia. During World War I, Berlin wrote “God Bless America.” The title was a phrase his immigrant mother fervently repeated during Berlin’s childhood, his daughter later said. Berlin decided to cut the song from the revue he wrote it for initially. It didn’t debut on the radio for another 20 years. But as America’s entrance into World War II drew nearer, the country embraced Berlin’s song. It played at both the Democratic and Republican conventions in 1940, and every Brooklyn Dodgers game that year. The song became an anthem of an array of causes: Striking garment workers and protesting subway workers sang “God Bless America” in the 1940s and ’50s. Students protesting racial segregation in Louisiana and Mississippi in the 1960s sang it. The anti-abortion movement adopted the song in the 1980s. By the 1970s, the widely employed “God Bless America” was taking on a conservative association that it retains to this day. Sheryl Kaskowitz writes in her book on the song, God Bless America: The Surprising History of an Iconic Song, that the deep social division over the Vietnam War marked a turning point for Berlin’s melody. Richard Nixon, the president who represented those conservatives rejecting the 1960s social movements, frequently referenced the song and even sang it at a state dinner alongside Berlin himself, who lived to the age of 101 and died in 1989. Ronald Reagan, the first president embraced by the new Religious Right, didn’t just play the religious-patriotic song at his rallies. In his earlier career as an actor, he actually starred in the 1943 movie “This Is the Army,” which was the first film to feature the song. Kaskowitz found in an online survey that sports fans who describe themselves as “conservative” or “religious” are more likely to support playing “God Bless America” at baseball games today. Others who have embraced and popularized the song continue to include, like Berlin, immigrants and admirers of this country who were not born in America. Among the most memorable renditions of the song in recent decades was Celine Dion’s version, recorded for a fundraiser album that hit No. 1 on the Billboard chart after the Sept. 11, 2001, attacks. Dion soulfully sings “God Bless America,” though she is Canadian. When Hispanic singer Marc Anthony performed the song at the 2013 baseball All-Star Game, racists attacked his performance, tweeting slurs including, “C’mon MLB. How you gonna pick a Mexican to sing ‘God Bless America’?” and much more. Anthony is Puerto Rican – meaning that he’s American. In other words, a century after the song was written, we’re still fighting about who is entitled to proclaim blessings upon the “land that I love,” “my home sweet home.” Berlin might answer: Anyone who knows the words.